In this communication, the authors discuss the issue of individualization of thyrotropin suppressive therapy in differentiated thyroid carcinoma (DTC) patients and share their views with respect to optimizing the dose of levothyroxine (LT) prescription both during discharge from radioiodine therapy ward and during follow-up. The changing management paradigm at our Institute during post-thyroidectomy period and during the preparation for radioiodine scan is also briefly highlighted. Five factors can be identified as important determinants for the dose individualization approach: (1) Persistence or absence of metastatic disease, (2) the risk characteristics of the patient and the tumor (3) patient's clinical profile, symptomatology, and contraindications (4) the feasibility to ensure a proper thyroid stimulating hormone TSH suppression level (depends on patient's socio-economic and educational background, the connectivity with the local physician and his expertise) (5) time period elapsed since initial diagnosis. While discussing each individual case scenario, the authors, based upon their experience in one of the busiest thyroid cancer referral centers in the country, discuss certain unaddressed points in the current guideline recommendations, deviations made and some challenges toward employing them into practice, which could be situation and center specific. In addition to these, the value of clinical examination, patient profile and detailed enquiry about clinical symptomatology by the attending physician in each follow-up visit cannot be overemphasized. According to the authors, this aspect, quite important for dose determination in an individual, is relatively underrepresented in the present guidelines. It would also be worthwhile to follow a conservative approach (till clear data emerges) in patients who have characteristics of "high-risk" disease, but are clinically and biochemically disease free, if no medical contraindications exist and patient tolerates the suppressive therapy well. This would be particularly applicable in the presence of aggressive histopathological variants, where, in the event of recurrence/metastasis, the disease demonstrates adverse prognosis and higher incidence of radioiodine refractoriness. At the end, certain important and noteworthy concepts pertaining to LT prescription that has definitive practical implications for the suppressive therapy in DTC patients are described. Purpose: Tropical pancreatitis (TP) is a juvenile, non-alcoholic type of chronic pancreatitis and is highly prevalent in Kerala, India. Increasing prevalence of TP and its varied manifestations prompted us to undertake this retrospective analysis. We attempted to study the incidence of TP in patients with primary hyperparathyroidism (PHPT) and correlate with calcium levels, scintigraphy and histopathology findings. Materials and Methods: Records of 44 hypercalcemic patients with raised parathormone (PTH) were analyzed. Clinical, biochemical and imaging findings were noted to look for diabetes mellitus and pancreatitis. All patients underwent dual phase 99m Technetium methoxy isobutyl isonitrile parathyroid scintigraphy in our department between January 2007 and 2010. Gamma probe assisted minimally invasive parathyroidectomy was performed. Histopathological correlation was obtained in all patients. Results: Our study shows 18% (8/44 patients) incidence of TP in patients with PHPT (compared to 7% reported in 1970's) in Kerala. Results show involvement of middle aged, non-alcoholic males. No direct association between severity of diabetes, pancreatitis and PHPT was noted in our series. Parathyroid adenoma was the most common underlying pathology. All TP patients' clinical outcome improved post parathyroidectomy. TP patients with PHPT demonstrated adenomas, mainly composed of oxyphilic cells. Non pancreatitis group interestingly showed a varied picture of adenoma, hyperplasia with predominance of chief cells histologically. Conclusion: There is a 2.6 fold increase in the incidence of TP (18%) in patients with PHPT. Hypercalcemia may be the causative factor leading to TP in PHPT patients in our limited series. The data suggests a causal association between pancreatitis and PHPT. Patients presenting with either one or a combination of hypercalcemia, pancreatic dysfunction or raised PTH need to be thoroughly evaluated as their management is interlinked. Introduction: Complex regional pain syndrome (CRPS) is primarily a clinical diagnosis. Diagnostic imaging in CRPS can be used, especially to exclude other disorders. The sensitivity and specificity of three phase bone scintigraphy (TPBS) for the diagnosis of CRPS is variable throughout the literature. Aim : To establish a simple and effective quantitative approach to help in the diagnosis of CRPS by TPBS. Materials and Methods : TPBS done in patients (n = 68) with suspected CRPS was analyzed retrospectively. They were classified into bone scan positive group (BSP), bone scan negative group (BSN) and non-CRPS group based on diffusely increased periarticular uptake, symmetrical uptake, and focal uptake respectively. Asymmetry score (AS) was also measured between the affected and unaffected side. Results: 16 patients showed focal uptake, 37 were in BSP group with mean AS score of 1.57 ± 0.5 and 15 were in BSN group with mean AS score of 1.01 ± 0.05. The mean AS was significantly different (P < 0.0001). AS of 1.06 had sensitivity and specificity of 96.43% and 100% respectively (P = 0.0001). There was a trend of negative correlation between the AS and the duration, r = −0.21; however, it was not statistically significant (P = 0.28). Conclusion: TPBS should be considered in the evaluation of CRPS to rule out patients who have focal involvement, not diagnostic of CRPS (~24% in this study). Quantitative AS of 1.06 can be included to support visual interpretation in the delayed phase. 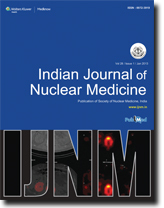 In the nuclear medicine, beta nuclides are released during the treatment. This beta interacts with bone and muscle and produces external Bremsstrahlung (EB) radiation. 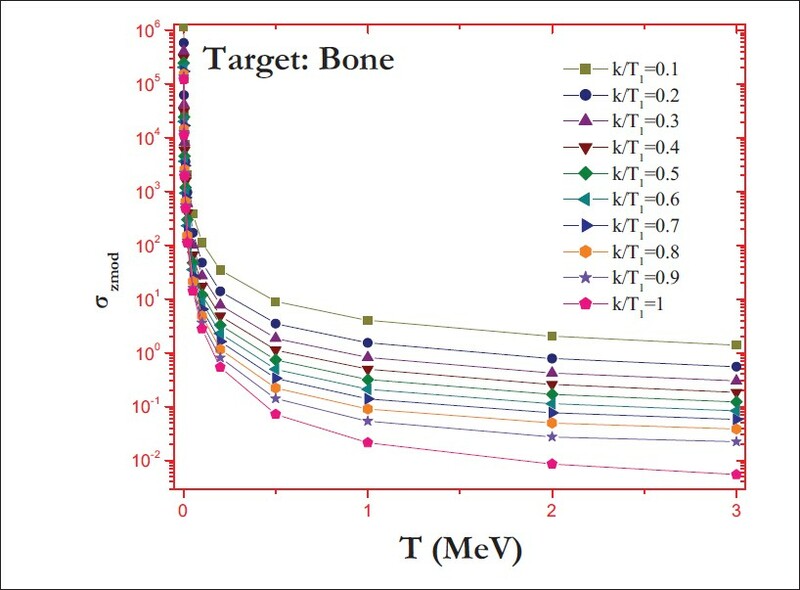 Present work formulated a new method to evaluate the EB spectrum and hence the Bremsstrahlung dose of therapeutic beta nuclides (Lu-177, Sr-90, Sm-153, I-153, Cs-137, Au-201, Dy-165, Mo-99, Sr-89, Fe-59, P-32, Ho-166, Sr-92, Re-188, Y-90, Pr-147, Co-60, K-42) in bone and muscle. The Bremsstrahlung yields of these beta nuclides are also estimated. Bremsstrahlung production is higher in bone than that of muscle. Presented data provides a quick and convenient reference for radiation protection and it can be quickly employed to give a first pass dose estimate prior to a more detailed experimental study. Subdural hygroma is the collection of cerebrospinal fluid in the subdural space. Most often these resolve spontaneously. However, in cases with neurological complications surgical drainage may be needed. 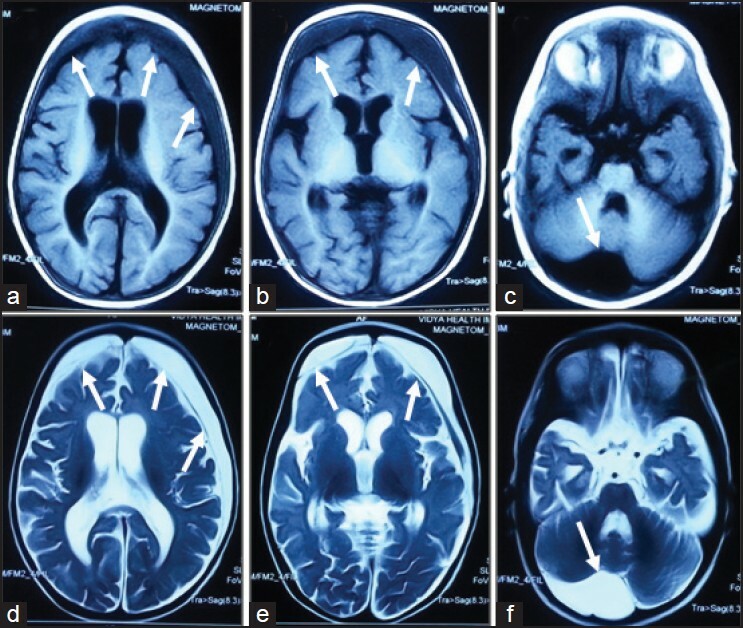 We here, present the case of an 8-year-old boy with post meningitis subdural hygroma. 99m Tc-ehylene cysteine dimer ( 99m Tc-ECD) hybrid single photon emission tomography/computed tomography (SPECT/CT) carried out in this patient, demonstrated the subdural hygroma as well as the associated cerebral hypoperfusion. If 99m Tc-ECD SPECT/CT is integrated into management of these patients, it can help in decision making with respect to conservative versus surgical management. Ectopic thyroid tissue (ETT) refers to all cases in which the thyroid gland is present at a location other than its usual site. The prevalence of ETT is approximately one per 100,000 to 300,000 persons and is reported to occur in one in 4,000 to 8,000 patients with thyroid disease. Multiple ectopia of thyroid is extremely rare. Multiple ectopia in the presence of orthotopic thyroid gland is extremely rare. We report a 13-year-old boy with stunted growth and developmental delay caused due to acquired hypothyroidism. 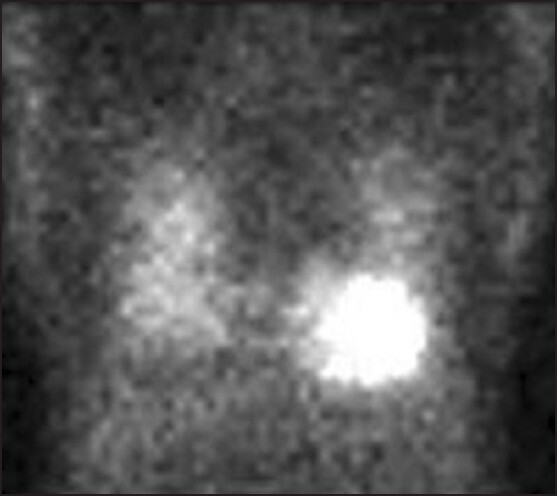 Technetium scan performed as per management protocol identified dual ectopia of thyroid. 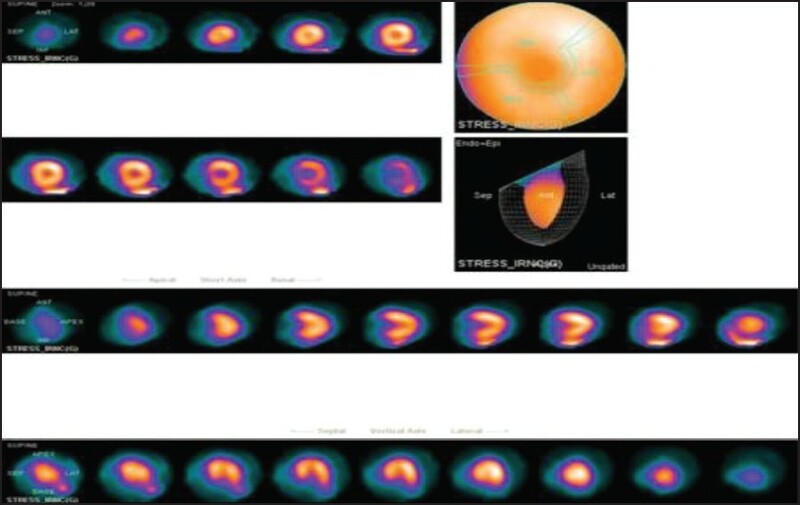 The role of hybrid Single-Photon Emission Computed Tomography/ Computed Tomography (SPECT/CT) in the localization of the sites of ETT is also highlighted. 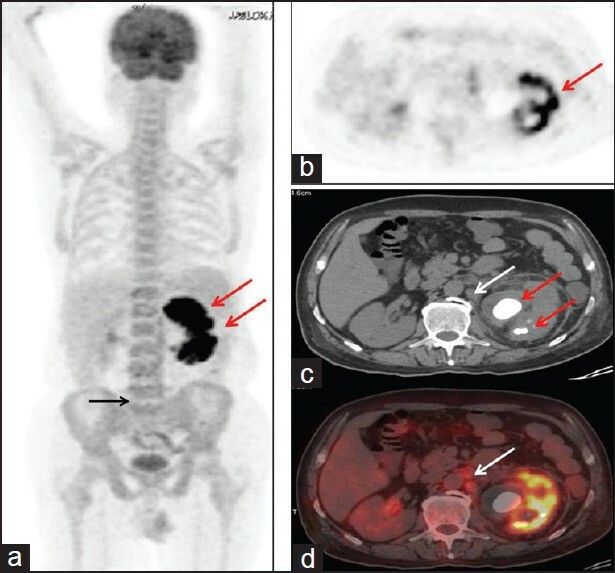 Fluorine-18 fluoro-deoxy-glucose positron emission tomography (F-18 FDG PET) is not sensitive modality for the diagnosis of primary hepatocellular carcinoma (HCC). However, FDG-PET imaging may be useful in the identification of extrahepatic metastases. 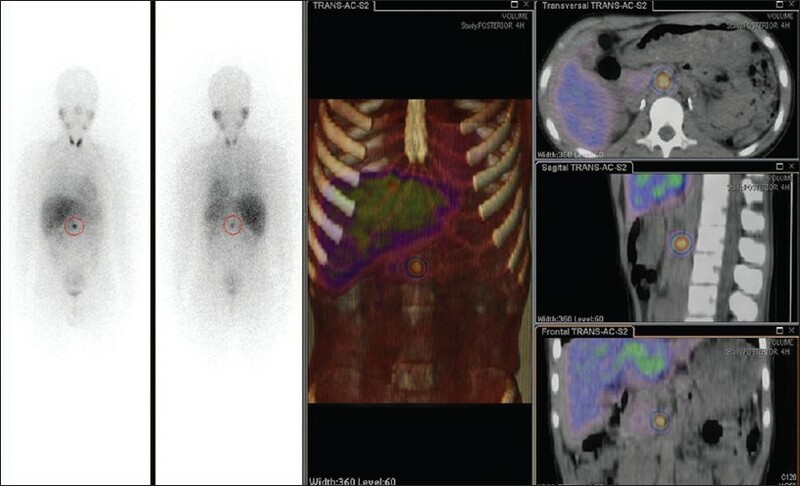 We report an interesting image of HCC with solitary metastasis to sternum detected by F-18 FDG PET/CT. Autoimmune pancreatitis (AIP) is most often incidentally detected, with the diagnosis being based on radiological characteristics. A steroid regimen for 6 weeks is the standard line of treatment for AIP. 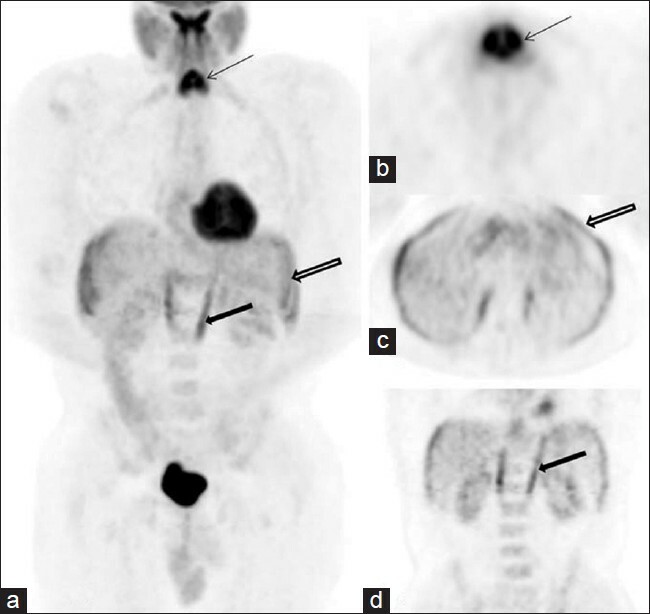 In our case, AIP was incidentally suspected on fluorodeoxyglucose positron emission tomography/computed tomography (PET/CT) performed for staging a malignancy, and a follow-up PET/CT study after steroid treatment, showed complete metabolic and morphological response; thus confirming the imaging diagnosis of AIP. 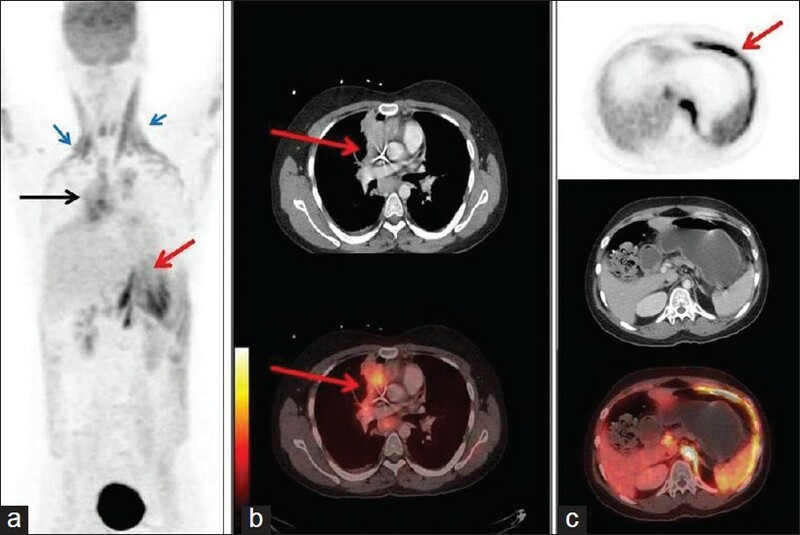 A 36-year-old Indian man, a recently diagnosed case of the right lung carcinoma underwent fluorodeoxyglucose positron emission tomography-computed tomography (FDG PET/CT) for staging of the malignancy. PET/CT showed increased FDG uptake in the right lung mass, consistent with the known primary tumor. Right hemidiaphragm was found to be elevated on CT, suggesting right diaphragmatic paresis. The PET scan demonstrated asymmetric, intense FDG uptake in the left hemidiaphragm and accessory muscles of respiration, which was possibly due to compensatory increased workload related to contralateral right diaphragmatic paresis. The right diaphragmatic paresis was hypothesized to be caused by phrenic nerve palsy by right lung neoplasm. Skeletal muscle metastasis as the initial presentation of the unknown primary lung cancer is unusual. A 65-year-old male patient presented with pain and swelling of the right forearm. Fine needle aspiration of the swelling revealed metastatic squamous cell carcinoma. 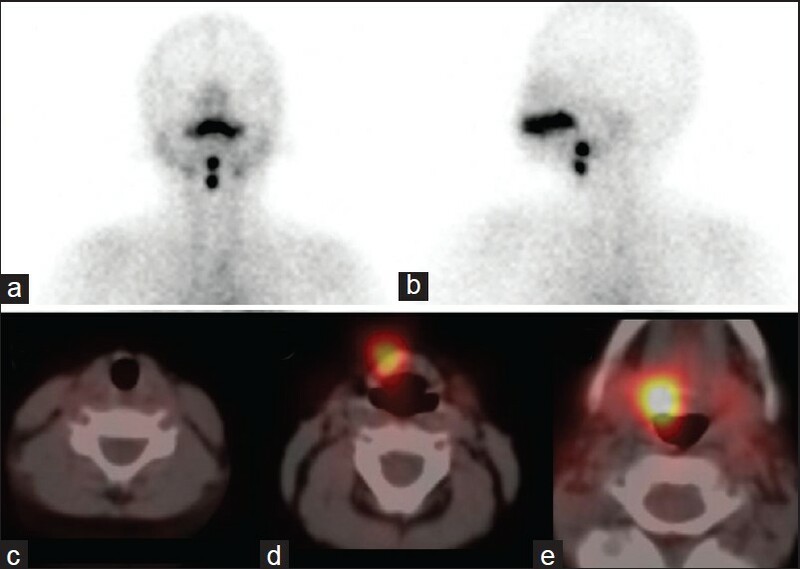 The patient underwent whole body F-18 fluorodeoxyglucose (FDG) positron emission tomography/computed tomography (PET/CT) to identify the site of the primary malignancy. 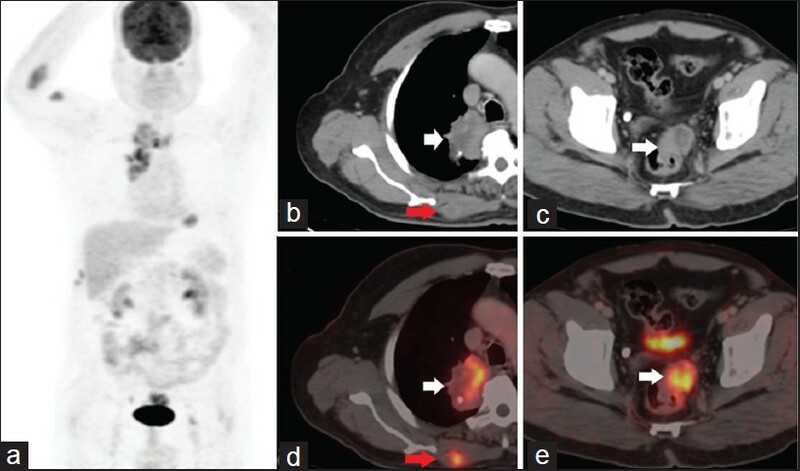 The authors present PET/ CT images showing FDG-avid metastases to the skeletal muscles along with a previously unknown primary tumor in the right lung, in a patient presenting with initial muscular symptoms without any pulmonary manifestations. Primary testicular lymphoma (PTL) a relatively rare disease of non-Hodgkin's lymphomas occurring with a lesser incidence of 1-2% has a propensity to occur at later ages above 50 years. PTL spreads to extra nodal sites due to deficiency of extra cellular adhesion molecules. We present detection of multiple sites of extra nodal involvement of PTL by F-18 positron emission tomography/computed tomography study aiding early detection of the dissemination thus aiding in staging and management. Because of the increasing clinical importance of gastric carcinoids and the difficulty in diagnosing them, the need for non-invasive diagnostic methods is growing. Currently, the only reliable method is upper gastrointestinal endoscopy with biopsy. 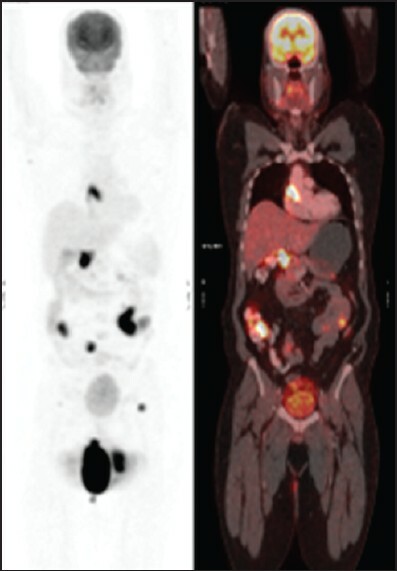 We report the case of a 32-year-old male where a combination of functional imaging studies ( 18 F-fluorodeoxyglucose-positron emission tomography/computed tomography [PET/CT] and 68 Ga-DOTA-NOC PET/CT) not only helped in the correct staging, but also highlighted certain important biological aspects of these tumors, which are important from the management point of view and can prognosticate the patients. Spontaneous intracranial hypotension (SIH) is a cause of new persistent headache, which disappears on recumbence and reappears in sitting/standing position (orthostatic headache). We present a case of orthostatic headache, where the patient was suspected to have SIH and was subjected to radionuclide cisternography (RNC) using 99m Technetium Diethylenetriaminepenta acetic acid for confirmation of diagnosis. After due consent from the patient, the radiotracer was injected intra-thecally and serial images were acquired until 24 h. The direct and indirect evidences of Cerebrospinal fluid (CSF) leakage, which were revealed in our study, provided objective evidence to the clinical diagnosis. RNC is an important investigation in diagnosing SIH and also identifying the site of CSF leak, which may aid the management. Myocardial perfusion imaging (MPI) with technetium-99m sestamibi (Tc-99m MIBI) is considered a diagnostic technique that is widely used for the investigation of suspected coronary artery disease. Incidental inspection of an extracardiac activity is indirect, but important marker, which can identify a potentially treatable non-coronary cause for chest pain that may mimic cardiac symptoms. Here, we present an illustrative case in which significant enterogastroesophageal reflux of Tc-99m MIBI occurred during the cardiac imaging following prompt hepatobiliary clearance. Because, there was normal myocardial perfusion on MPI, presence of gastroesophageal reflux (GER) on GER scintigraphy and detection of mild inflammation with pathologically confirmed hyperplastic polyp by endoscopy, in view of the above findings we concluded that the probable cause of chest pain was reflux. Xanthogranulomatous pyelonephritis (XGNP) is an uncommon condition characterized by chronic suppurative renal inflammation that leads to progressive parenchymal destruction. This condition can clinically present as recurrent urinary tract infections, flank pain, hematuria, and occasionally sepsis, and weight loss. This condition is usually associated with obstructing renal calculus. 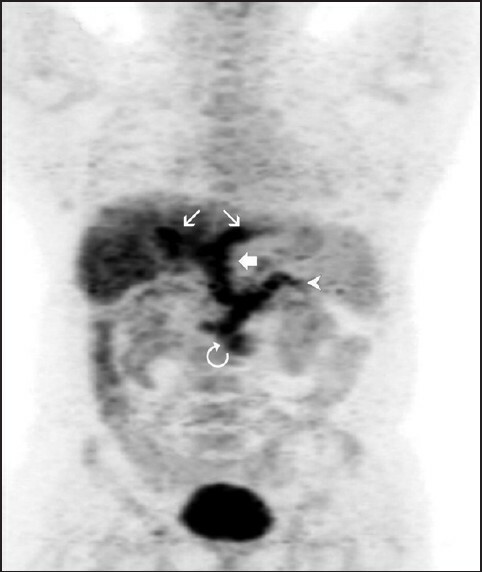 We present 18-fluorodeoxyglucose positron emission tomography-computed tomography (18-FDG PET/CT) findings in an elderly male suffering from pyrexia and weight loss and suspected urinary tract infection. PET/CT findings in this case lead to diagnosis of XGNP. This diagnosis should be kept in mind while evaluating similar symptoms and PET/CT scan findings. Dyspnea can rarely be due to diabetes mellitus induced neuropathy. The term "trepopnea' is sparingly used in clinical practice and refers to dyspnea on assuming a particular lateral decubitus position Trepopnea is rarely described in association with unilateral diaphragmatic paralysis, which in itself is an uncommon cause of respiratory distress. 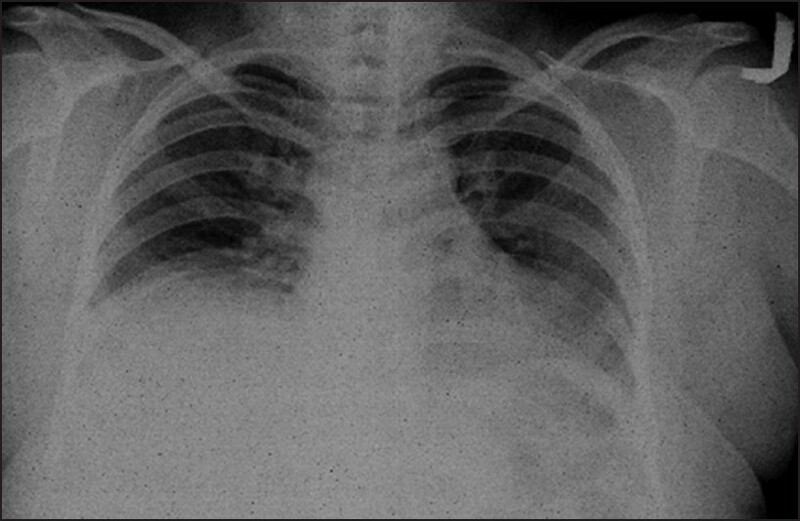 We report a 27-year-old diabetic female who presented with sudden onset of dyspnea. On close interrogation, patient complained of dyspnea that was exaggerated while lying on the left side (left lateral decubitus position). A fluoroscopic sniff test showed a paradoxically moving right diaphragm confirming the diagnosis of unilateral diaphragmatic paralysis attributed to diabetes induced isolated phrenic nerve palsy. This case highlights the importance of ventilation - perfusion imaging in non-pulmonary etiologies and also attaches importance in recognizing trepopnea as an early clinical symptom of diaphragmatic paralysis. This case illustrates that diabetic neuropathy due to isolated phrenic nerve palsy can occur in the absence of peripheral neuropathy and that glycemic control is unrelated to the manifestation or severity of this disease. 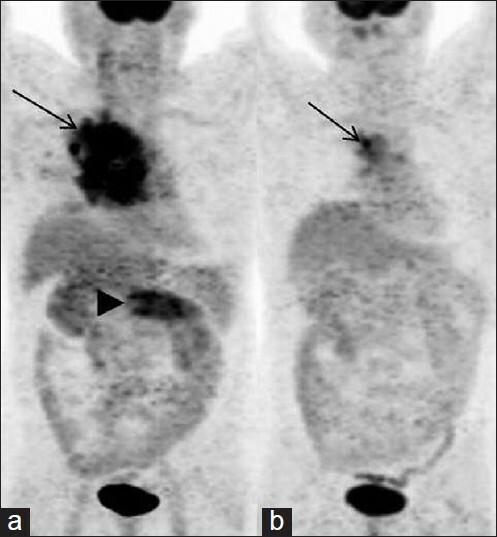 Detection of thrombus is usually an incidental finding on fluorodeoxyglucose positron emission tomography/computed tomography studies. Nevertheless this is an important finding in terms of disease prognostication and in planning the treatment strategy. We herein report a case of a 50-years-old male, a diagnosed case of hepatocellular carcinoma with extensive hypermetabolic thrombus involving the entire portal venous system.